NH Berlin Alexanderplatz has 225 newly-redecorated guest rooms near Alexanderplatz, boasting BerlinÃ¢â¬â¢s television tower and upscale shopping centre, Alexa. 13 conference rooms host gatherings. The hotelÃ¢â¬â¢s airy restaurant with terrace, fully-equipped wellness area, including sauna and steam bath allow guests to unwind in luxury. The restaurant serves sophisticated Mediterranean, international, and regional dishes in a warm atmosphere, on the terrace in summer weather. Segway or bike tours of Berlin may be arranged, and underground parking is also available. 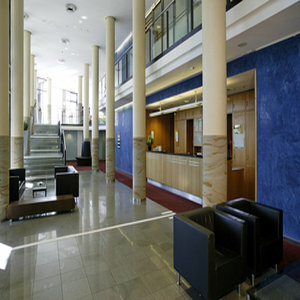 NH Berlin Alexanderplatz offers a choice of standard or superior room. All rooms have free WiFi, signature plush mattresses and flat-screen televisions. The modern, standard rooms encompass 24 square meters and offer choice of queen-sized or two twin beds. VIP amenities are available in the spacious 28 square-meter superior room. Each superior room provides guests with luxury amenities, including a plush bathrobe, complimentary newspaper, and bottled water.